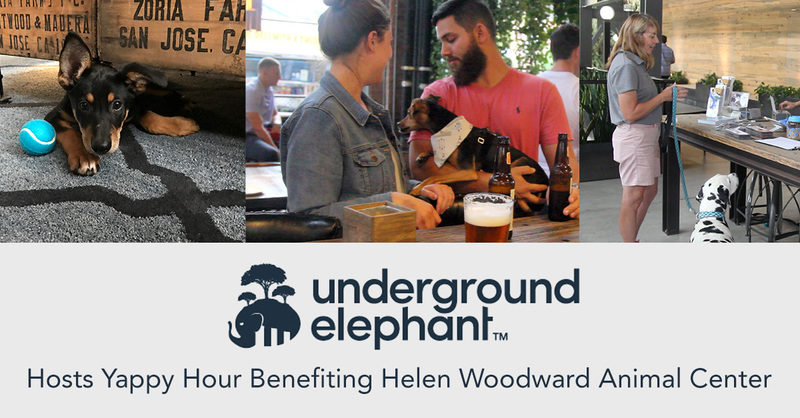 On Thursday, August 24th Underground Elephant opened its doors to the public for a fundraiser supporting local, San Diego nonprofit, Helen Woodward Animal Center (HWAC). The fundraiser, a Yappy Hour titled “Bark n Brew” at Underground Elephant’s “Watering Hole”, invited guests to bring their friends (both canine and human) out for a night of drinks, local food, and live music at UE’s location in downtown San Diego. Guests were also invited to play with dogs and puppies brought by HWAC, all of whom were available for adoption at the Center. Using the office space to host events like this Yappy Hour to support local, San Diego, nonprofits is at the core of Underground Elephant culture and the company is proud to be in partnership with nonprofits like Helen Woodward Animal Center. Many employees stayed after their work day ended to support and donate to HWAC, and even helped run the Yappy Hour event. “I love working for a company that sees value in supporting nonprofits, especially ones like Helen Woodward that are saving local dogs, cats, and other animals,” said Monique Diaz, a member of the Underground Elephant Productions Team. Thank you to all who came out! With your support the Yappy Hour event raised over $1000 for Helen Woodward Animal Center! Helen Woodward Animal Center is a unique, private non-profit organization in San Diego County that has been committed to the philosophy of people helping animals and animals helping people for over 40 years. Located on 12 acres in Rancho Santa Fe, California, their nationally recognized center provides a variety of services that benefit the community through educational and therapeutic programs for people, and humane care and adoption for animals. They are a no-kill facility that receives no government funding and relies heavily on tax-deductible contributions from private donors to continue our life-saving mission. To see more of Underground Elephant’s partnership with Helen Woodward Animal Center, watch this video. I’ve noticed that you guys have a strong passion to helping out animal shelters! I’m sure the Woodward Animal Center was very happy to have you partner up with them. I would definitely have so much fun if I was a guest in your event! Hope you set up more events just like that again, I am a huge fan of animals. Great job Underground Elephant team.